Here are my picks for the top 10 Air Frying Cookbooks. Air Frying is all of the rage it’s also a very simple way to eat healthily. With some of these cookbooks, you will be on your way to great awesome meals, desserts, appetizers and more! Put your Air Fryer to good use with some handy and delicious recipes from our very own Allison Waggoner! “In the Kitchen” Air Fryer Cookbook is choc-a-block full of healthy and yummy recipes – universal recipes for all types of Air Fryers. The recipes work with any model of air fryer, convection and induction air cooking. The book has over 100 recipes – simple and easy dishes from breakfast to desserts! This cookbook is your complete Air Fry cooking guide – it takes you step by step to create, not only the recipes in the book, but all of your favorites. The frequently asked question guide section answers all your questions about air frying, and a variety of recipes – everything from award-winning Buffalo Wings to the perfect French fry, Biscuit Beignets with Praline Sauce, Maple Glazed Donuts, Vegetable and Kale Chips, Soy Salmon Steaks, Taco Cups, Pizza Rolls, Island Coconut Shrimp, Corn Bread Salad, Southern Buttermilk Fried Chicken, Chocolate Lava Cakes, Lemon Sponge Cake, Pecan Pie Bread Pudding and much more! Foods you love without the grease. Healthy cooking means a healthy you! The Air Fry Everything! cookbook creates fried food fast without the added fat, calories or guilt. Created by The Blue Jean Chef, Meredith Laurence, Air Fry Everything!offers over 130 all new, flavor-bursting recipes, including restaurant makeovers, like Blooming Onions, Beer Battered Onion Rings, Chicken Wings, Shrimp Egg Rolls, and Skinny Fries, and turns them into healthy and crunchy, lower calorie alternatives. Additional recipes include Parmesan Chicken Fingers, Fish and “Chips,” Cherry Chipotle Chicken Wings, Crab Cakes, Coconut Shrimp, Fried Cauliflower with Parmesan Lemon Dressing, homemade potato chips, Boston Cream Donut Holes, and much more. Your air fryer can create more than “fried” foods, and Air Fry Everything! gives you recipes for that too including Marinated Rib-Eye Steak with Herb Roasted Mushrooms, Inside Out Cheeseburgers, Honey Mesquite Pork Chops, Maple Balsamic Salmon, Roasted Vegetable Stromboli and Mini Molten Chocolate Cake, just to name a few. Plus foolproof recipes for making perfect bacon, roasting garlic, toasting nuts and creating crispy tortilla chips. As always Meredith also provides tips and tricks to help you get the most out of your air fryer, plus how to cook your favorite frozen foods without all the added oil that goes along with deep-frying. Air Fry Everything! 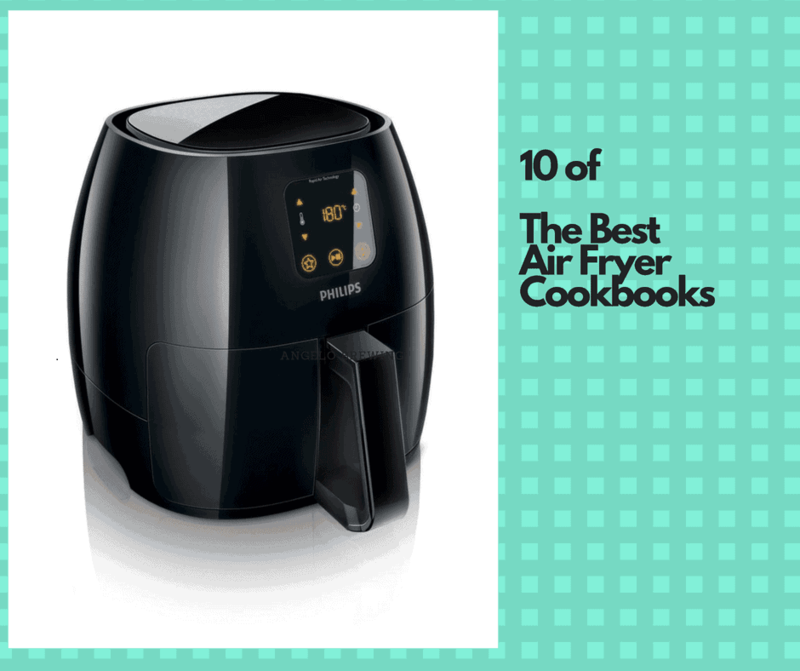 is the must-have cookbook for anyone who owns an air fryer. The Blue Jean Chef turns her culinary genius onto the latest hot cooking appliance trend―air frying! Whether you’re a novice in the kitchen or a more experienced chef, Air Fry Genius takes home cooks beyond air frying as a trend, teaching you how to use any air fryer to create easy, delicious meals with less guilt than traditional frying. Including 100+ recipes―from wholesome breakfasts to decadent desserts, and each paired with color photos―Air Fry Genius also includes Meredith Laurence’s signature tips and tricks for getting the most out of your air fryer using frying, roasting, and baking techniques to create healthier, faster, and less messy meals to impress your family and friends. Those new to air frying will love Air Fry Genius’s “Easy” recipes for beginners, along with tips on how to convert traditional recipes to air fryer recipes, air fry cooking time charts, and primers throughout the book on various air-frying techniques. Experienced cooks looking to enhance their culinary skills will also love this book, with recipes and ways to take their air-frying skills to the next level. Vegetarian, vegan, and gluten-free recipes are abundant, as well as tips for planning ahead. All recipes includes nutrition information so you can be well-informed about what you’re eating. When you think “air fryer” you probably don’t think mixed berry muffins for breakfast, tuna zucchini melts for lunch or spicy Thai beef stir-fry for dinner. But, it’s not as crazy as it sounds. The Complete Air Fryer Cookbook goes beyond fried foods to give you creatively inspired meals that are baked, grilled, roasted and steamed. Full of tips and tricks to get the most from your air fryer, The Complete Air Fryer Cookbook shows you how to make meals you’ll love with all of the taste and none of the guilt. The Complete Air Fryer Cookbook brings you recipes such as Omelette in Bread Cups * Bacon Tater Tots * Sweet and Hot Chicken Wings * Seafood Tacos * Pesto Gnocchi * Mexican Pizza * Savory Roasted Sweet Potatoes * Chocolate Peanut Butter Molten Cupcakes * Apple Peach Cranberry Crisp * and much more. The Only Air Fryer Cookbook You’ll Ever Need Includes a PDF file with photos of all the recipes Hot Air Frying: A Surprising Way to Cook Your Food Whether you are yet to buy an air fryer or you already own one, it is good to know its basic function and features. First and foremost, reading manufacturer’s instructions for operation and cleaning is a must. Here are some of the most important air fryer features. When your food is in the cooking chamber, superheated air is circulated around it to cook everything evenly. Thanks to its innovative features, you will be able to cook foods fast, easy, and more conveniently. Then, air fryer has an automatic temperature control so you can be assured that your food will be perfectly cooked. Your air fryer makes great meals without a fuss. The digital screen allows you to set your cooking preferences and enjoy the advantages of hands-free cooking. This is one of the best features of an intelligent kitchen machine. Hot air frying machine does more than just fry. You can bake a wide variety of cookies, roast meat, and vegetables, make the best puddings, etc. You can also add a grilling element for extra flavor and crispiness. Air fryer works more like a convection oven than a fryer. There are great air fryer accessories on the market like air fryer baskets, grill pans, baking pans, double layer rack with skewers. We can use silicone, metal, or glass in most models. Nevertheless, always read machine’s instructions before using any bakeware in your air fryer. By all means, you will be able to get that deep-fried taste with only 1 tablespoon of oil. Therewithal, many argue that air-fried food tastes better. Air fryer allows you to make better food choices and you can have nutritious and great-tasting meals without the hassle. An air fryer offers inspiration for many people to cook healthy and well-balanced meals every day. Hot air frying requires very little fat so that your meals retain most of their valuable nutrients. Frying, baking, roasting, grilling―there’s nothing your air fryer can’t do. Although your air fryer is healthier than a deep fryer, not all air fryer recipes are truly healthy―, especially for your heart. Linda Larsen grew up loving fried foods, but as an adult, she needs to eat food that is healthy and nourishing. Today, the author of the bestselling The Complete Air Fryer Cookbook uses her air fryer to cook meals that are just as delicious as her fried favorites―and good for her heart, too. Linda’s air fryer recipes in The Healthy Air Fryer Cookbook combine the ease and simplicity of your favorite appliance with the added benefit of total-body nutrition. This is the only air fryer cookbook that offers truly healthy, easy, and whole-food recipes, so you can enjoy fried foods while being good to your heart. With The Healthy Air Fryer Cookbook, you don’t have to sacrifice your health to enjoy fried foods. With My Philips AirFryer Cookbook, you will easily get a nutritious, flavor-packed, family and figure-friendly meal on the table any night of the week. Rebecca Dunlea, shares 100 dishes that come together in a snap in your air fryer. Air fryer is a popular innovation in the market nowadays. Cooking food in the air fryer makes your life easier. If you are someone who does not have enough time to cook for the family, then air fryer is the best machine you should have. The food gets ready within minutes without any hassle! If you do not feel like cooking much, then “Air Fryer Cookbook: 500 Simple and Delicious Recipes for Your Family” will help you get through the kitchen faster than you can think of! Name any recipe, and you can make it in the air fryer. The delicious meals will fill your life with excitement. If you are looking for a proper guide for every kind of food which you can cook in air fryer you should have this cookbook in your collection. All the recipes are easy to make with the simple ingredients. You just need to pick your favorite recipe and start making it now! Do you own an exciting Air Fryer? Do you want to be able to use it to its optimum capabilities and produce delicious and healthy food? You can do it with the help of this amazing new book, which provides you with stunning recipes, complete with full-color photographs of each one to show you what kind of dish it is and what the completed one should look like. This book also provides you with handy units of measurement, indicated in both the metric and American systems for the convenience of readers in any country. And with a complete table of nutritional facts to accompany each dish, you can keep tabs on calorie intake and make sure you and your family are getting all the nutrition you need.